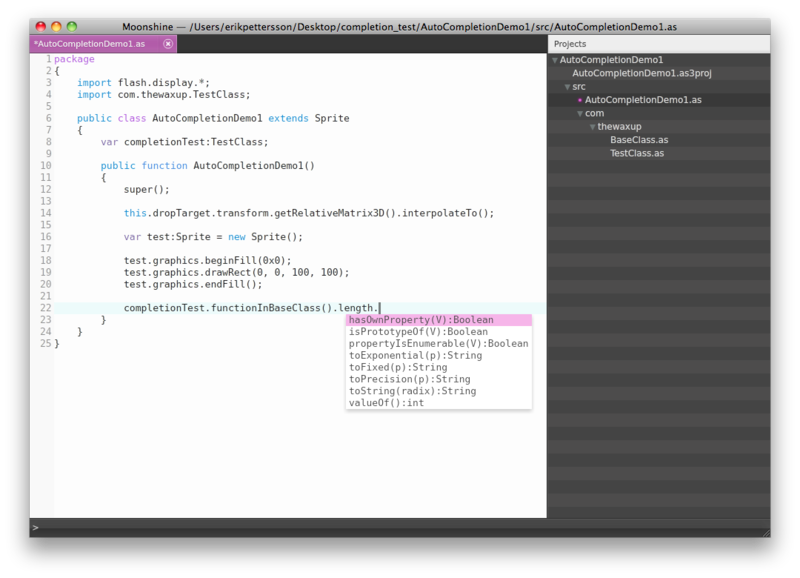 Moonshine is a middleweight AS3/Flex IDE implemented in Flex 4 & AIR with custom-built source editor using Flash Text Engine. The IDE has basic auto-completion, syntax highlighting, text manipulation (selection, cut, copy, paste, undo, redo), find/replace, project view and templates. Under the hood it uses AIR NativeProcess (through mxmlc) and fsch to handle the compilation tasks. It provides compiler errors & warnings, breakpoints & debugging, syntax parser and a command line panel (simple interface for plugins).